Christina Timblin Photography Blog Posts — Exceptional professional photography for every occasion. This is the beautiful and massive Richardson Olmsted Complex. I actually took this photo a few months ago. Originally it was the Buffalo State Asylum for the Insane. Built in 1872, it’s one of just 2,500 National Historic Landmarks in the country. It’s now home to Hotel Henry restaurant and hotel. I had the chance to see the building this past summer and it was very spooky and interesting. If you haven’t been, I highly suggest going and checking it out. Spend an hour and walk around, have a drink at the bar, and just appreciate the incredible architecture and history right here in our hometown! Today’s photo is of the beautiful Liberty Building. It was built in 1925, and at that time, was the largest office building downtown. The building originally had 3 Statue of Liberty replicas standing 36’ tall. Just the two facing east and west on the roof remain. The Liberty building is currently the 5th tallest building in Buffalo. 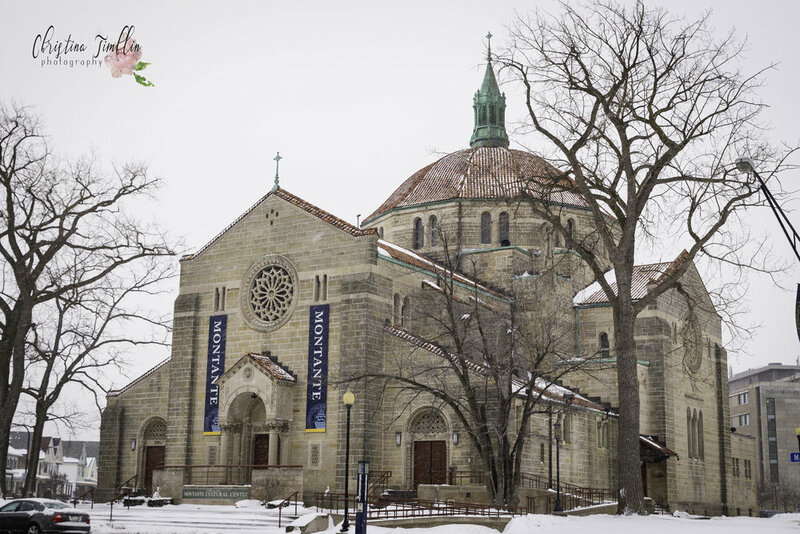 This photo is of the Montante Cultural Center at Canisius College. This beautiful building was renovated to transform it from St. Vincent de Paul church, to a multi-use auditorium and performance center. I actually got to watch my husband graduate from his police academy here just last month! The inside is gorgeous and special attention was paid to every detail, preserving its original beauty. This building is 74 years old and still used by the college and public today. Okay, it’s not a building, but it’s beautiful and I needed something pretty to look at today. 🙂 What makes this picture so special to me is the color! Check out the trees- we had such a crazy hot fall and strange winter that some of the trees have held onto their leaves. The tree in my front yard has almost all of its leaves still! So if you’re walking around WNY, look for spots like this. Usually drab and colorless, wooded areas in Buffalo are prettier and just more enjoyable to me this year! Who’s ready for another National Historic Landmark? This 117 year old building is the Buffalo History Museum, formally known as the Buffalo and Erie County Historical Society. Architect George Cary designed this building to resemble the Parthenon in Athens, Greece. I attended a wedding inside the museum probably 15 years ago and it was awesome! Gorgeous inside as well as outside. And fun fact- my own wedding photos took place on those steps 7 years ago. Another day, another beautiful Buffalo building! Today I’m featuring Statler City. This is actually the second Statler to be built in Buffalo. The first was demolished in 1968. That hotel started off with 300 rooms and each room had a bath, which was a big deal back then! Their slogan was “a room and bath for a dollar and a half." Yep, that’s right- $1.50/night! While the original stayed open until 1967, it was renamed Hotel Buffalo in 1923 when this second Statler Hotel was built. Since then it has gone through several name changes, transition from hotel to office building, a failed renovation to turn it into a hotel/condo, bankruptcy, and is currently undergoing refurbishing. The Buffalo Main Light lighthouse is up next! Built in 1833, this was a functional lighthouse until 1914. It stands at 60’ tall and is on the National Register of Historic Places. The lighthouse is on the grounds of the Coast Guard station, but they gave up some of the land and made the lighthouse accessible to the public starting in 2010. It’s pretty cool to see up close in person, and the view of the city is fantastic! Happy Hump Day! Today is a rather simple photo, it’s a bison on Niagara St. by the 190. But the history here is pretty cool. These bisons are made of fiberglass and the original bisons, appearing back in 2000, were part of a Roswell Park and Burchfield-Penney Art Center collaboration. The bisons were made and handed out to various Buffalo artists to decorate, were placed on display around Buffalo, and eventually auctioned off to benefit Roswell. These days you can see the Buffalo roaming on thruways, businesses, city streets, etc. Interestingly, the first bison was made over 100 years prior, in 1895, and is still owned by and on display at the Buffalo Museum of Science. From 1929-1945, it stood outside the Buffalo Central Terminal. His name is Stuffy, and soldiers and travelers would pet him for good luck. He’s made of iron wire and papier-mâché and topped with an actual bison hide. Next time you’re at the museum, stop by and visit Stuffy! Up next- the Connecticut Street Armory. This giant castle-like building was built in 1899 and is a historic National Guard armory. This is another Buffalo gem listed on the National Register of Historic Places. It’s home to the 74th Regiment of the New York National Guard. What’s really crazy is that building alone takes up 3 acres! A whopping 280,362 square feet counting all three stories! It’s not a surprise that this was the largest armory in the entire country at the time it was built. Another fun fact- the armory is made of Medina sandstone and is in the Sandstone Hall of Fame! Yup, Medina, NY, not too far out from B-lo. And Medina sandstone is pretty darn interesting, too! It was such a great material to work with, and it’s maintained its strength and beauty after over 100 years. It’s fireproof and the appearance today is almost identical to the day the armory was built. The sandstone is so awesome that it’s been shipped to and used in the New York State Capitol and Buckingham Palace! It’s incredible how much awesome history we have, not only in Buffalo, but all of Western New York! 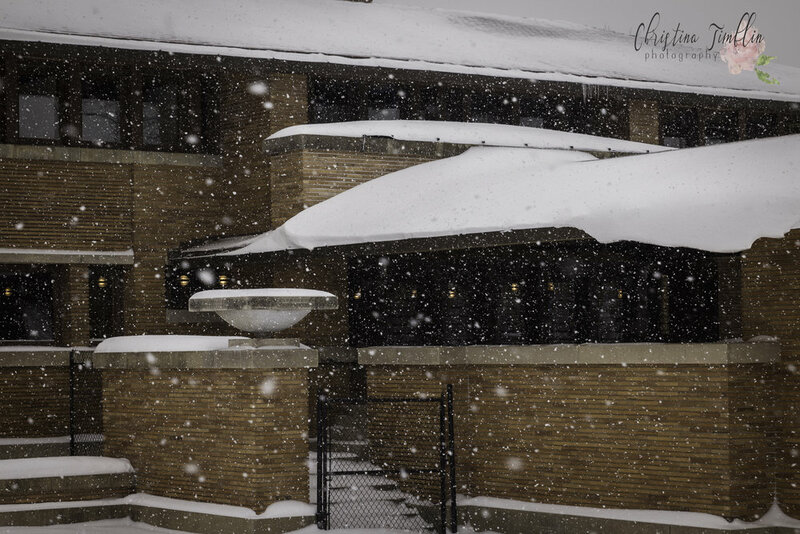 Finishing up this week’s beautiful places in Buffalo- the Darwin Martin House. It’s on the National Register of Historic Places and is a National Historic Landmark. 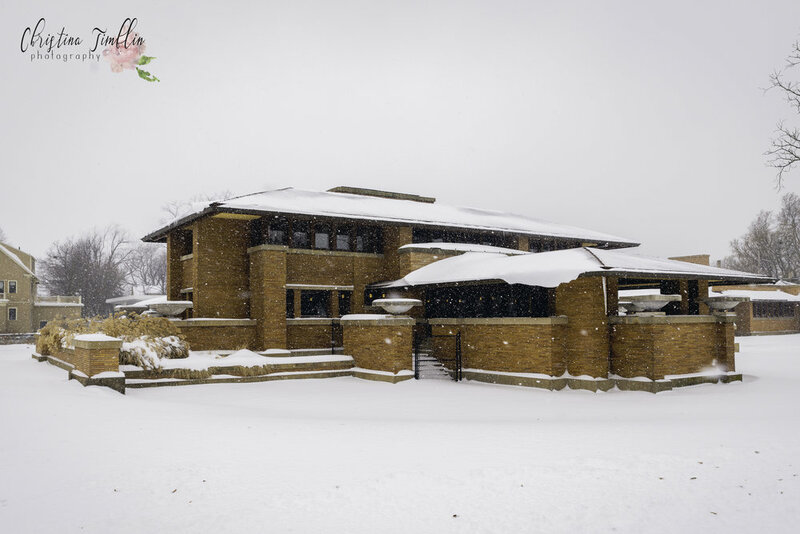 This house was designed by Frank Lloyd Wright in 1903, and is said to be one of the most important house designs of his career. The house was designed for Darwin D. Martin, his wife Isabelle, and his sister and brother-in-law. His sister, Delta, lived with her husband in the Barton House, a smaller house connected to the complex. Also included were a carriage house, stable, conservatory, pergola, and gardener’s cottage. Wright and Martin became close friends and when Wright’s career took a turn for the worse, Martin helped support him. Later Wright designed another major complex for Martin in Derby, on Lake Erie. So last month I had a pretty fun maternity session at a park in Clarence, NY. We took full advantage of the gorgeous setting sun and even set off a few smoke bombs to celebrate the gender of the baby- a girl! Kelly is a friend of mine and a second time mama. She was so excited to give birth to her first little girl and I just knew the session had to be special. The dress she is wearing is handmade by yours truly! I love adding personal touches and taking what would be a regular photo shoot, to the next level. Parker, Kelly's 4 year old son, was a rockstar the entire time we were shooting! It's not always fun for young kids, and they tend to get a little bored and anxious that late at night. But he was a superb little helper and looked cute as hell, even with a broken arm! Faith Victoria was born about a month ago and she's just as cute as her big bro! I can't wait to see what's in store for this adorable little family in the future. I don't know about you, but I am sick to death of winter! Super happy that the weather is starting to warm up, but the rain is a real pain when you have kids. I've been trying think of some rainy day activities since the next week looks like it will be pretty wet. I may just take them outside tomorrow when it's supposed to be 60 and let them jump in mud puddles! While capturing it all with a camera of course! I'm looking forward to the blooming of flowers and trees so I can get back to outdoor family sessions. If you open your junk drawers, desk drawers, random shoeboxes, etc, would you find a cd with pictures on it? I can tell you right now that I would! When is the last time you put that cd in your computer and enjoyed the images on it? Do you even know what the pictures are of? Don't feel bad, we are all guilty of it- paying for professional images only to let them sit in digital form on a disc that we had such high hopes for. When we get these discs of pictures we upload them to Facebook, search for cute photo books online, look for deals on canvases, check out Pinterest for the newest and most unique ways to display our loved ones, etc. But how many people actually get past the Facebook album upload?? One of my favorite things to do in a house I've never been to before is check out the walls. I love looking at pictures and catching a glimpse into someone's life. Walls often tell a story, with wedding portraits, new baby pictures, children's artwork, awards and diplomas. Walking from room to room is like turning the pages in a book, with special moments and accomplishments frozen in time to enjoy and remember day after day. As a mom, I love seeing pictures of my children from last year and the year before right in my living room. There's no scrolling through my phone or searching Facebook for old pictures when I'm feeling nostalgic. I just look up from my morning coffee and admire my babies! We live in a time when everything is literally at your fingertips. Anything you could possibly need or want can be found in your phone. Technology is seriously awesome! I love being able to take 40,000 pics of my kids and pets in a 24 hour period, but I also value the printed photograph. My mission as a photographer is to provide my clients with images that they can cherish forever, and a big part of that is getting away from discs and actually printing the memories. Because I deal with prints and products vs digital images on cds, this makes me a different type of photographer than many people are used to. Instead of mailing or dropping off a cd and never seeing you again, I actually go over every final image in person with you and help you decide which artwork is best for your needs and budget. Pictures in frames are nice, but I've got way more fun ways to display your cherished photos! My personal favorite is the wooden plaque mounted photograph. It's sturdy and gorgeous, needs no frame, has a built in slot for hanging, and has crisp clean edges. It's great for any type of photo. My next fav is the vivid metal luxe print! This looks awesome and edgy and is a completely unique wall hanging or desktop picture. Senior pictures and fall family shots look great on the coated metal. It has a mount for hanging that doubles as a stand for a desktop. Of course I offer a variety of albums and books, such as the mini accordion album, which makes a perfect gift for parents and grandparents. These things are great and I've gifted many myself! I'd love to challenge everyone to either get their old pictures printed or book a photographer who will help them do so. Get that gorgeous family portrait put on canvas and hang that baby over the couch! You won't regret it! This summer has been a great season for me. I've had the opportunity to photograph some beautiful weddings and attend 4 as a guest. 2016 truly was a summer full of love! I think my favorite part of wedding photography is the people I get to work with! I've been so fortunate to work with some amazing photographers like Kristy Tasca and Bryan Wray. They've selflessly taught me so much and given me tips and tricks on how to catch the perfect shots. Without them I would've taken much longer to get to where I'm at today. As a whole, the photography industry has been very kind and welcoming to me. I'm a bit sad that wedding season is coming to an end, but my favorite is starting! I seriously LOVE autumn and the gorgeous fall family photos with the changing leaves. I can't wait to get some families and kiddos out playing in the leaves this year! Sunday was such a special day! I got to spend the morning with Sarah and Joe at Glen Falls in Williamsville and photograph them for engagement pictures. We had been watching the weather all week hoping for a nice coating of snow to get those perfect winter wonderland shots and Mother Nature did not disappoint! Though it was pretty cold, we had beautiful fluffy snow falling from the sky and even got to hang out with a few brave ducks. This awesome couple from Tonawanda is getting married in July after spending several years together. They make the cutest couple and their wedding is going to be an absolute blast! I can't wait to share it with everyone this summer! Hello and welcome to my blog! I'm so excited to share all sorts of fun things with you in the future- from session experiences, tips and tricks, and crafty ways to display your portraits. First, let me introduce myself- my name is Christina Marie Timblin and I am 31 years young. I have been a photographer for about 4 years now and love everything about it! I'm married to an amazing man and have 3 wonderful children. I love animals more than most people I know, enjoy sewing, crafting, remodeling, and all things art and music. Balancing it all isn't always easy, sometimes it's downright stressful. On top of my photography business and home life, I also have a pretty awesome little sewing business. I make a variety of baby items and call it work! Aha! Another favorite pastime turned into a successful "job"! Seriously though- it's taken me a good year to figure out how to balance everything and it's just now all stating to click into place easier. If I could offer up any advice it would be to ask for help. I rely heavily on my husband to help with both businesses and family members to help with childcare. When I need to get work done I reach out and ask for someone to come entertain the rugrats. It's the easiest thing to tell someone to do, but it isn't always the easiest for those of us who like to do all! Thanks for stopping by and seeing what Christina Timblin Photography is all about and I look forward to updating you on all sorts of fun stuff in the future!